Image courtesy of the Herald and Weekly Times. 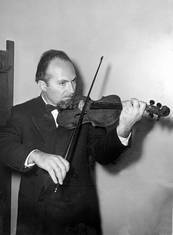 Dr Michael Bialoguski was a war-time refugee from Poland, a classically trained violinist and a qualified medical practitioner. He was talented enough as a violinist to be invited at one stage by Sir Eugene Goossens to play for the Sydney Symphony Orchestra. Bialoguski had worked part-time as an undercover agent of Australian intelligence organisations, from 1945. He came to know Petrov very well after meeting him at a Russian Social Club in 1951, and reported to ASIO that Petrov was a Soviet agent. For his part, Petrov attempted to cultivate Bialoguski as a Soviet agent in the field. Director-General of ASIO. Colonel Spry oversaw Petrov’s defection, and approved the payment to him of £5,000 for the defection and as payment for the information Petrov bought across. Colonel Spry also instructed his operatives in Darwin to disarm the Russian couriers and offer Mrs Petrov asylum. Colonel Spry was the Head of ASIO from 1950 until 1970. Ron Richards was the ASIO Director (Operations) who headed up the ‘Operation Cabin 12’ plan for Petrov’s defection. Richards was introduced to Petrov by Dr Bialoguski’s dentist, Dr Beckett. Richards slowly gained Petrov’s confidence and talked him through the process of defection during a series of covert meetings. He recorded the meetings he had with Petrov on a ‘minifon’ tape recorder. At the time of the Petrov case Michael Thwaites was Director, Counter-Espionage, ASIO. Thwaites is also known as a poet, Rhodes Scholar and spy. Thwaites’ account of the Petrov Affair is given in his book Truth Will Out. He was also ghost writer of the book published under the Petrov’s name, Empire of Fear. The events of the Petrov Affair were played out in and around some well known Canberra landmarks.